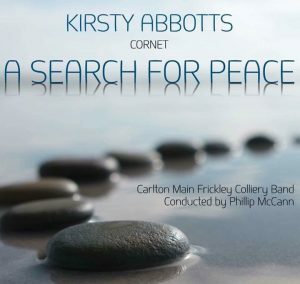 The new solo recording from cornet virtuoso Kirsty Abbotts is now available for purchase. Accompanied by the Carlton Main Frickley Colliery Band, the highly anticipated second solo contribution from Kirsty showcases her renowned musicality, under the direction of Phillip McCann and Leigh Baker. Entitled ‘A Search for Peace’, the release features new and old repertoire from a variety of composers, including Peter Graham, Pete Meechan and Leigh Baker, who has written a piece ‘Dedication’ as a tribute to the band’s former player and librarian Kenny Ralph. It also includes new compositions from the band’s composer-in-residence Ben Hollings, and two compositions by Rebecca Lundberg, including the title track ‘A Search for Peace’ which was commissioned by Kirsty for the CD. The band’s former professional conductor Phillip McCann was keen to stress his appreciation of Kirsty’s playing on the CD and was also particularly proud of the links that have formed between the University of Huddersfield and the band, commenting on the number of current and past music students that have either performed on the CD or composed music for it. ‘The cd was a super showcase for some of our Alumni and there are so many fabulous past and present students performing, conducting and composing at such a high level. Kirsty is the pinnacle in the art of cornet playing, and we also had Leigh Baker, Ben Hollings and Rebecca Lundberg all contributing incredible new compositions. I see them all as an integral part of the future brass band repertoire. Carlton Main Frickley epitomises what true brass banding is all about in the way they encourage and support these young musicians who are our future’.